So where have the last five weeks gone? Linda is on tag #5 and this is my fifth one too, with inspiration taken from the music background and emboss resist that Linda has used. From there on, mine is completely different, but without that spur looking at how Linda made hers I wouldn't have created this. Thanks for the creative nudge every week Linda, I am so enjoying this. I have used a number of favourite things on here which makes this eligible for Simon Says Stamp and Show your favourites. For instance the DI colours I have used are weathered wood, vintage photo and walnut stain, I just love this colour combination. Also on my hit list are stamps by Tim (we just keep collecting them don't we? ), Christmas papers from MME and downloaded vintage music paper. The other thing that is an absolute favourite and that I love making at the moment are my extended tags. Hels at Sunday Stamper is asking for metal and I think the pin and bells will count here. 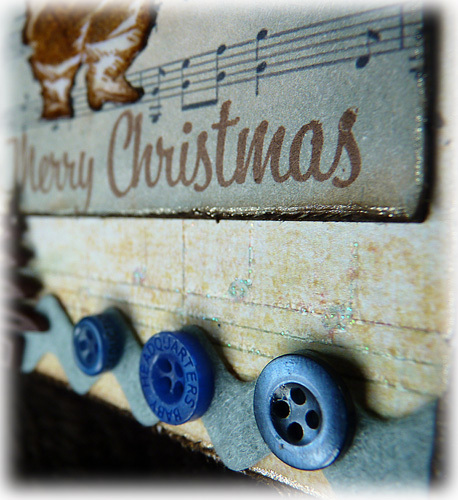 I seem to be using these little bells on most of my tags this year, mind you I do have an abundance of them. Sugar Creek Hollow are looking for Sparkle and this can be seen on the sparkly embossing powder I used as well as on some of the paper snowflakes with sparkle pen used in their centres. I also used a Sakura sparkle pen round the edges of the tags. Other embellishments are from my supplies plus a TH fragment. Santa was stamped, coloured over with more ink and with a water brush then covered in embossing ink and clear EP to make him shine and pop more. Did I say that I had been chosen as top pick for a swcond week running at Sugar Creek Hollow, I feel so chuffed and want to thank the girls for all their support. Today is Friday Eve as I read on someone's blog recently, so have a great end to the week and a lovely weekend. Splodgeaway - Sparkle and Gems- I bought a Slodgeaway mat from Barbara Gray at Ally Pally and love the effects I get with blending inks. 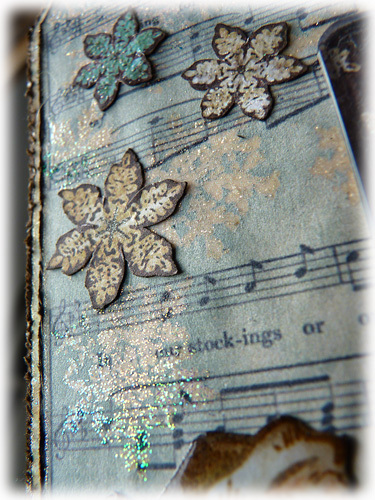 Fabulous extended tag - beautifully designed and distressed. I couldn't agree more on the colour combination (gorgeous), and the music manuscript - some of my favourite things too - so I really love this! Great interpretation of tag 5 Brenda, love that Santa stamp and your colours are fabulous!! Beautiful tag! I do love that colour combination even if I don't use it very often. I love all the little details and the background is gorgeous. Thanks for your visit to my blog too! The colorcombination is Marvelous Brenda and a very lovely en beautiful Tag. Beautiful background and stars. I like the use of the music Brenda and also the jolly Santa. A gorgeous tag Brenda. I love the colours and the way you extended the bottom of the tag. Just catching up with your blog, you have some very inspiring projects - I really don't know how you mangage to do so much and remain so individual!! Brenda that's a wonderful tag with great details. Love the colors and the little buttons. 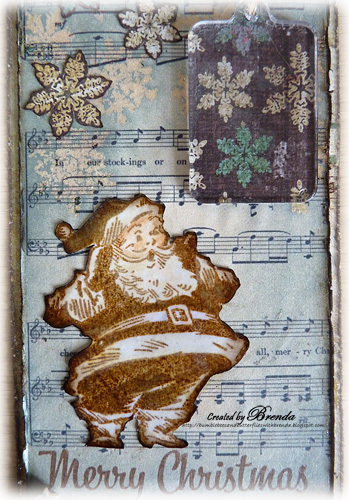 Love the use of distress inks sparkle and christmas. Nice one Brenda. Thank you for joining in the splodgeaway challenge. This is lovely, and now I see what you were working on, on your desk! 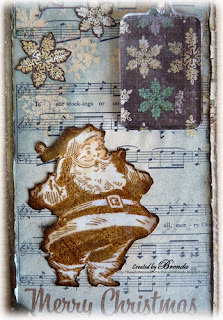 Gorgeous tag, love the chubby Santa image and the colours you used. Thank you for joining in our challenge at Craftymess. I just love what you did with this tag, Brenda! What a fun and beautiful Christmas piece! You have inspired me to do something with that Santa!!! Happy Friday! Hugs! I love your take on the challenge! Oh it's marvelous!!!! I am so happy you are playing with Linda! I hope I get a minute to start as well! Love your texture and those snowflakes! Santa loves his sparkle, doesn't he? Love what you've done with Santa... he looks so joyful on this tag, Brenda. What a beautiful combination of favorites! Love the colors you used and that Santa is too cute! Beautiful vintage tag! Thanks for playing along with us at Simon Says Stamp and Show! Love this tag Brenda, so beautifully vintage! I'm playing catch up with Linda's tags, they are a real inspiration aren't they? You put me to shame I still haven't done Christmas yet. Gorgeous. Your tag is gorgeous Brenda! I love that little button border! Adorable card! I love the non-traditional Christmas colours and the vintage feel. Thanks for joining us at It's all about the vintage and beauty! Oh, Brenda, this is just wonderful. LOVE the way this came out. Now I want that Santa stamp - LOL. I really like the way you stamped the snowflakes on black and the fragment piece! Just an all-round piece awesome piece of work! Great to see you back with us again this week.